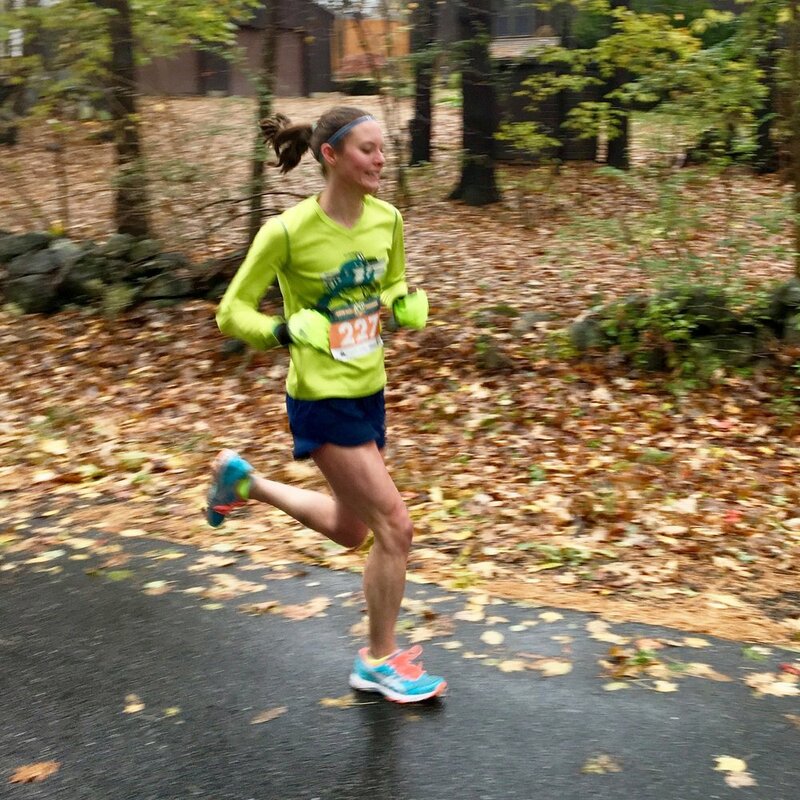 Yesterday I ran the Loco Marathon in Newmarket, NH and had the best marathon of my life (so far!). We drove down to NH the day before in a terrible storm full of snow, sleet, rain, and wind. Fortunately, the weather passed through and race morning was about 40 degrees with just some light rain at the beginning. The temperatures felt quite comfortable compared to the heat and humidity from the summer. I was really confident in my training and ready to race. The plan was to run around 7:10 to 7:20 pace, which I did really well until mile 20-26 when I was just slightly slower. The last 3 miles were on a trail that was very rocky and muddy. It was really hard to keep a fast pace with exhausted legs on uneven terrain. I did my best though, and I am so proud of the results. I passed the second female around mile 16 and held my place all the way to the end. My family did a great job cheering me on at multiple points throughout the race and always gave me a huge energy boost when I saw them. It was so wonderful having them all at the finish too. Nutrition: Clif energy gel at miles 7, 13, and 20. Water at all the aid stations (every 2-3 miles). I love this face above from the finish line. It is a perfect expression of all my feelings - happiness, relief, and pain. Today my legs and feet are very sore, but my heart is content and satisfied. I love running and training, but it is even more special when all your dedication adds up to an amazing performance. This marathon was over 8 minutes faster than my previous record. My positivity, strength, and focus really came through. My new race shirt and celebratory post-marathon pancake breakfast are shown below. 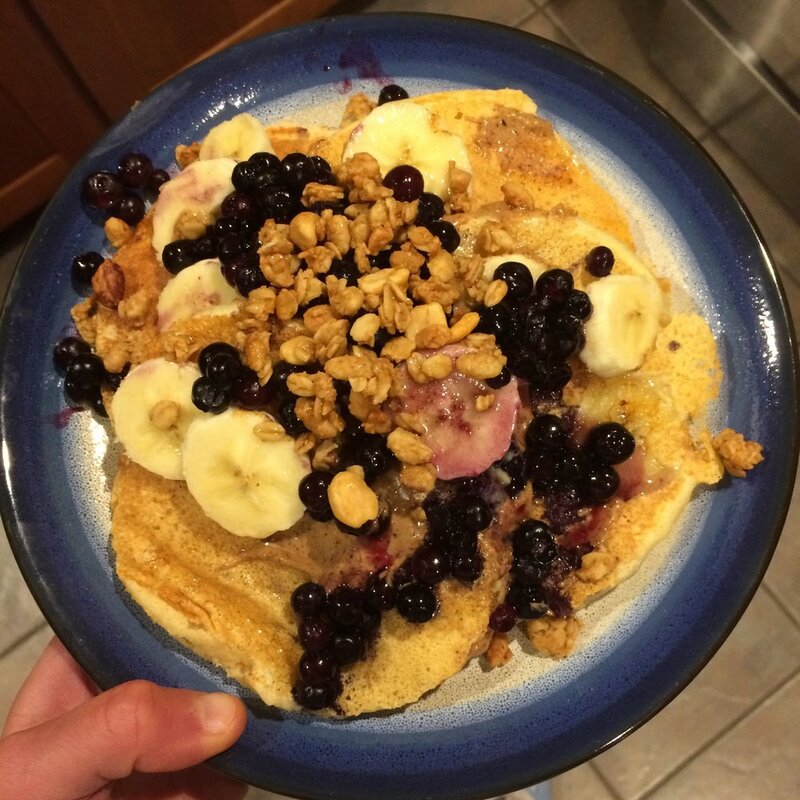 The pancakes are my creation of blueberry, banana, peanut butter, granola, and maple syrup of course! I got a huge bag of goodies for placing second female. I am most excited about the $25 gift card to LLBean and these LLBean/Darn Tough socks! I definitely got way more in awards than I paid for the race. I can’t wait to see what I can do in the future, but first up is rest and recovery. Hope you have a great week!